Historical Look At Our Lowest Temps In SE NM. Brutally Cold Across Northern U.S. This Morning. 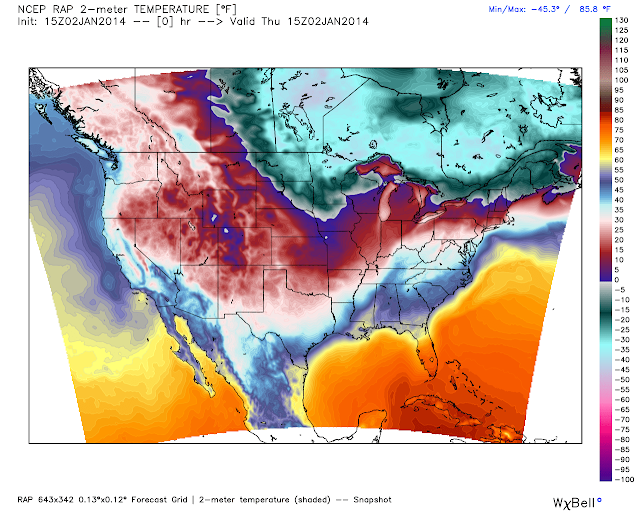 RAP Temperatures @ 8 AM MST. RTMA Temperatures @ 8 AM MST This Morning. HRRR Wind Chill Temperatures @ 7 AM MST. 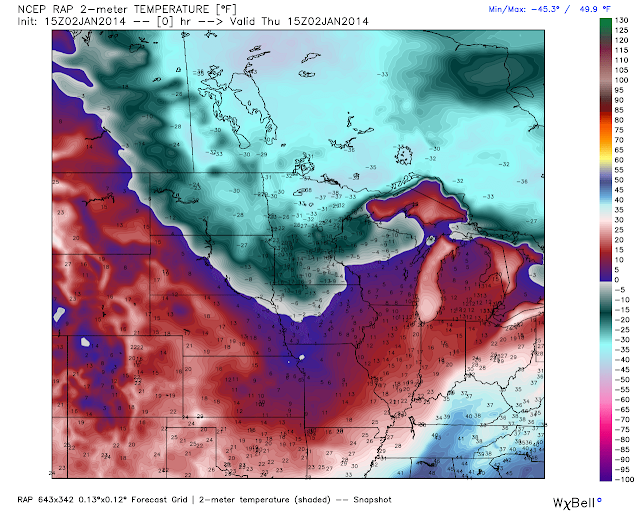 A temperature of -47F was reported in Embarrass, Minnesota at 7 AM MST this morning. 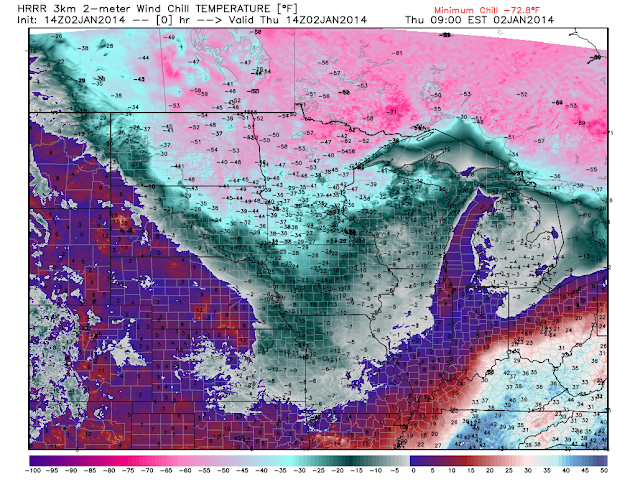 Wind chill values of -50F to -70F were indicated by the HRRR model near the Minnesota and Canadian border at 7 AM MST. January On Average Is Our Coldest Month. January on average is our coldest month of the year in southeastern New Mexico. Although most of our all-time low temperatures records were established in February. Keep in mind that even colder temperatures have been recorded in the local area in February. Consider the following daily records for the local area. These include the coldest daily high temperature and the daily lowest temperature for January. Daily Lowest High Temperature Records For January. Daily Low Temperature Records For January. 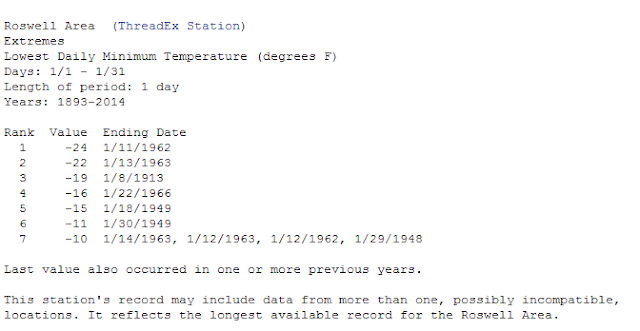 On average Roswell's coldest daily high temperature occurs on January 4th with an average daily high temperature of 52F. 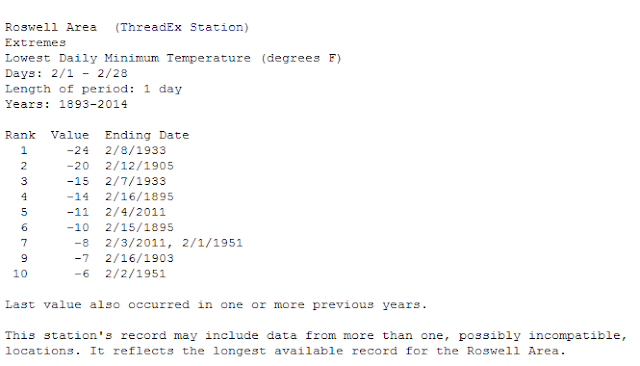 On January 5th Roswell has an average daily low temperature of 21F. On average Artesia's coldest daily high temperature occurs on January 4th with an average daily high temperature of 53F. On January 3rd Artesia has an average daily low temperature of 21F. On average Carlsbad's coldest daily high temperature occurs on January 8th with an average daily high temperature of 57F. 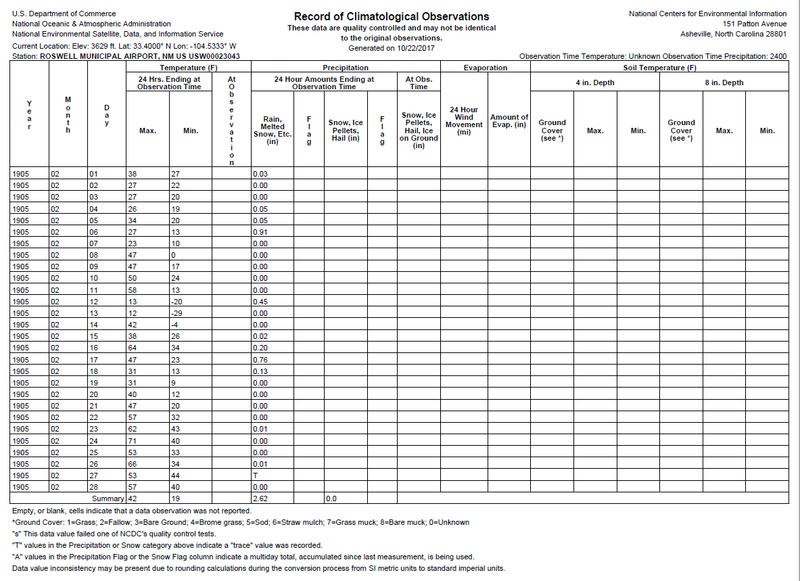 On January 8th Carlsbad has an average daily low temperature of 26F. 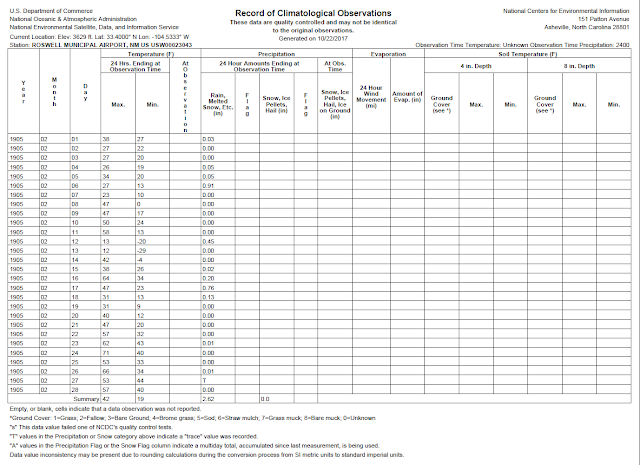 On average Hobbs coldest daily high temperature occurs on January 10th with an average daily high temperature of 53F. On January 8th Hobbs has an average daily low temperature of 26F. On average Tatum's coldest daily high temperature occurs on January 7th with an average daily high temperature of 51F. On January 8th Tatum's has an average daily low temperature of 22F. Coldest Temperatures Recorded In SE NM. 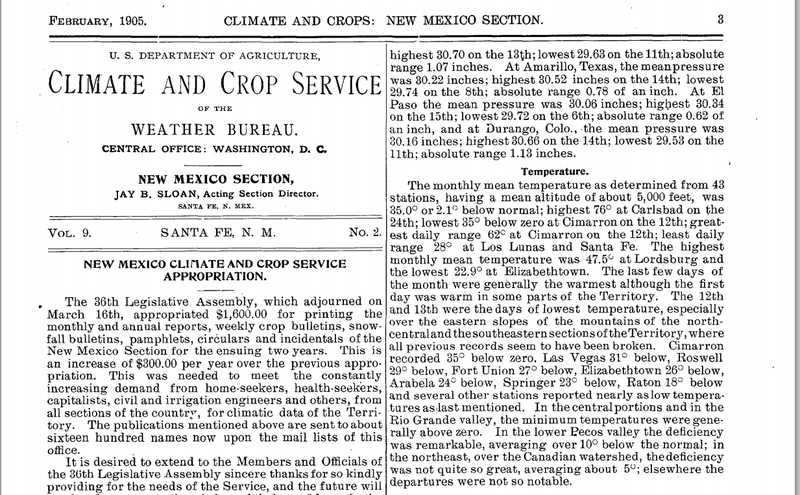 Artesia, NM Feb 8, 1933. On February 8, 1933 the Artesia National Weather Service Climate Co-Op Observer recorded a high temperature of 7F. This after an overnight low temperature of -35F. This reading was recorded in town at the old New Mexico Gas Company Office - near what is now the Artesia Daily Press Office. 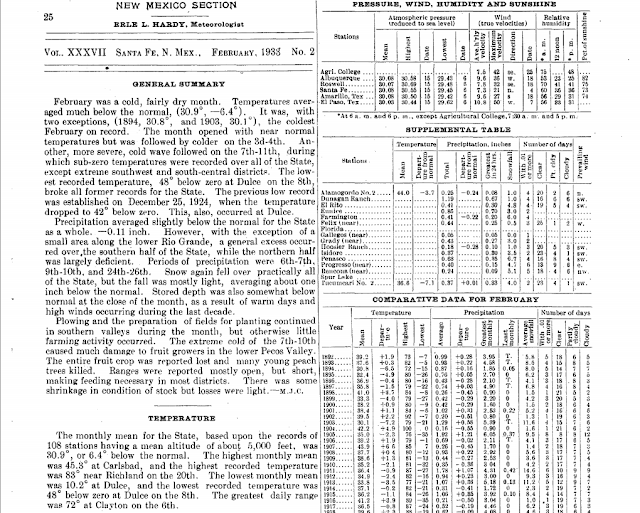 Other unofficial temperatures of as low as -43F were recorded in the Artesia vicinity according to local newspaper articles. A lot of people locally that I talk to now about this extreme event simply do not believe me. Not that I blame them either. These are just insane temperatures to be noted this far south in the U.S. and not to mention in the lowest elevations of the state of New Mexico. Can you image the damage and hardships that would be inflicted upon our local Oil Field and Agriculture Industries (the Cow Dairies especially) here in southeastern New Mexico and west Texas, should we ever see these types of extreme temperatures again? Not to mention the damage to homes and businesses also. We simply are not prepared for these extremes. Take a look at some of the local National Weather Service Climate Co-Op Stations that recorded lows that morning very close to Artesia's readings. Hagerman, NM February 8, 1933. 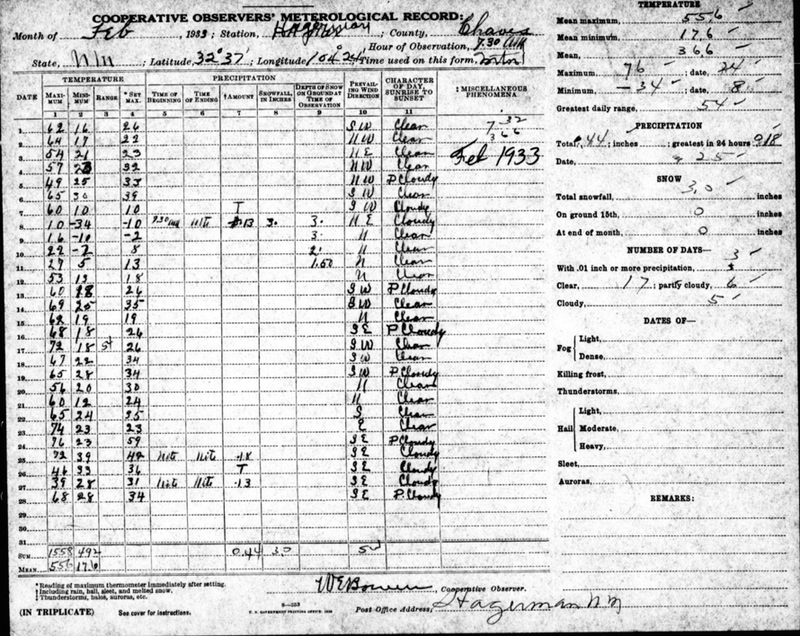 On February 8, 1933 the Hagerman National Weather Service Climate Co-Op Observer recorded a high temperature of 10F. This after an overnight low temperature of -34F. Tatum, NM February 8, 1933. On February 8, 1933 the Tatum National Weather Service Climate Co-Op Observer recorded a high temperature of 22F. This after an overnight low temperature of -32F. Lovington, NM February 8, 1933. 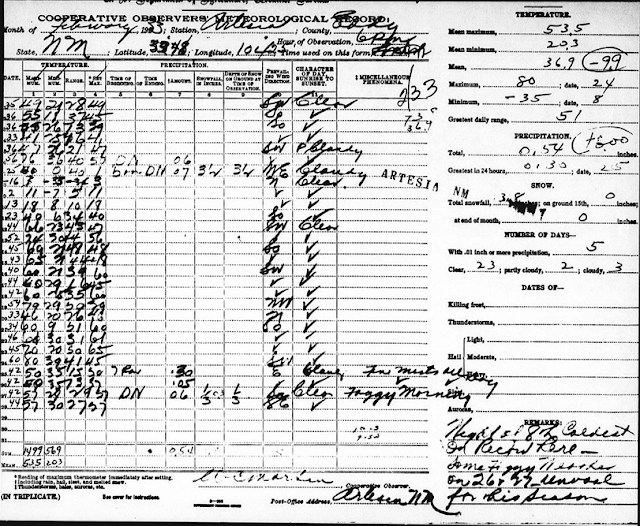 On February 8, 1933 the Lovington National Weather Service Climate Co-Op Observer recorded a high temperature of 19F. This after an overnight low temperature of -27F. Hope, NM February 8, 1933. On February 8, 1933 the Hope National Weather Service Climate Co-Op Observer recorded a high temperature of 1F. This after an overnight low temperature of -22F. Carlsbad, NM February 8, 1933. 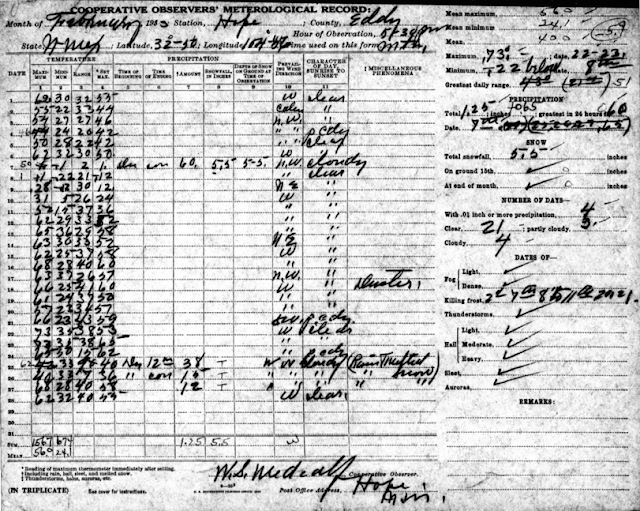 On February 8, 1933 the Hope National Weather Service Climate Co-Op Observer recorded a high temperature of 20F. This after an overnight low temperature of -17F. 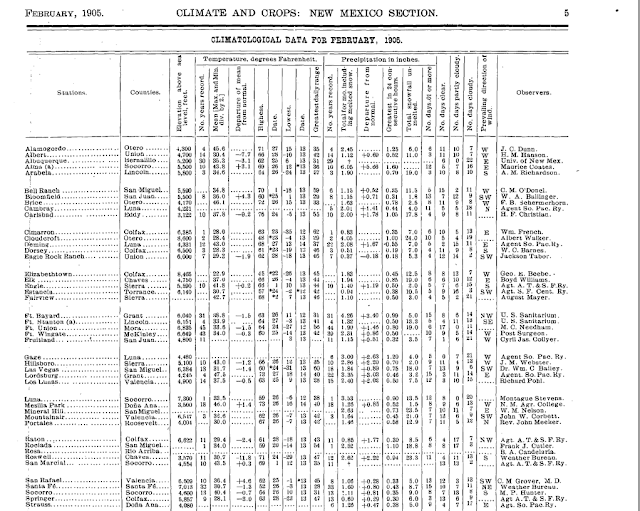 I do not have a copy of the Roswell, New Mexico monthly climate sheet available for February, 1933 at this time. 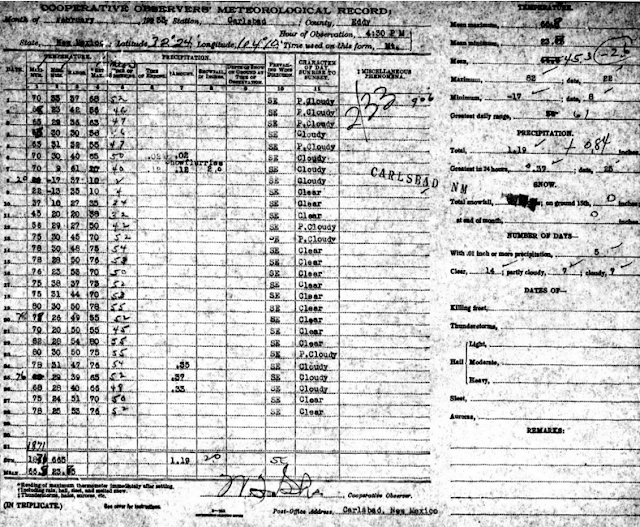 So On February 8, 1933, the Roswell National Weather Service Climate Co-Op Observer recorded a high temperature of 10F. 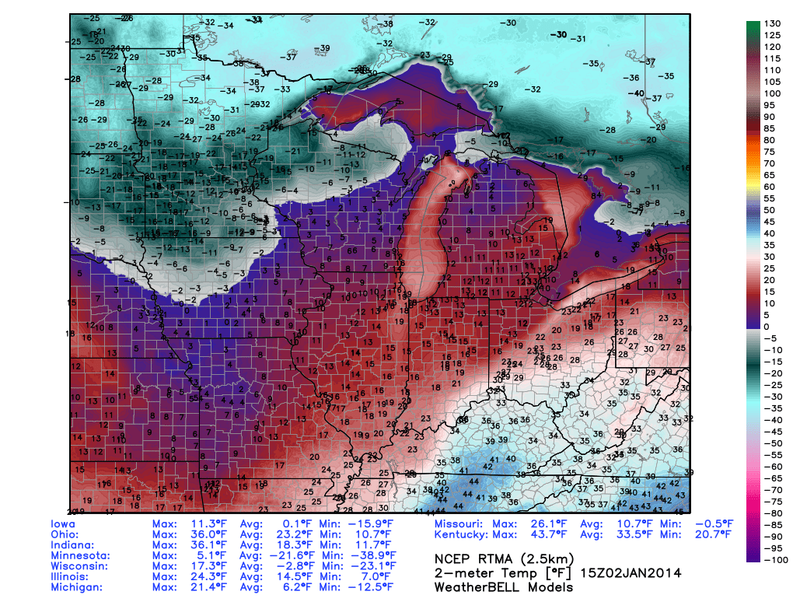 This after an overnight low temperature of -24F. 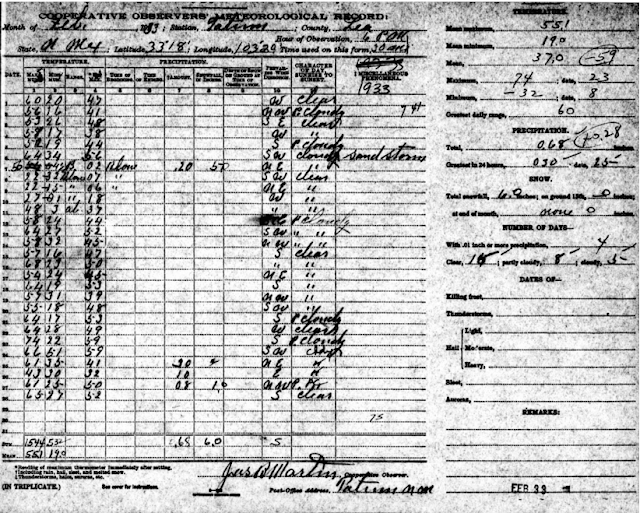 Roswell's Lowest Temp - February 13, 1905. On February 13, 1905 the Roswell National Weather Service Climate Co-Op Observer recorded a low temperature of -29F. 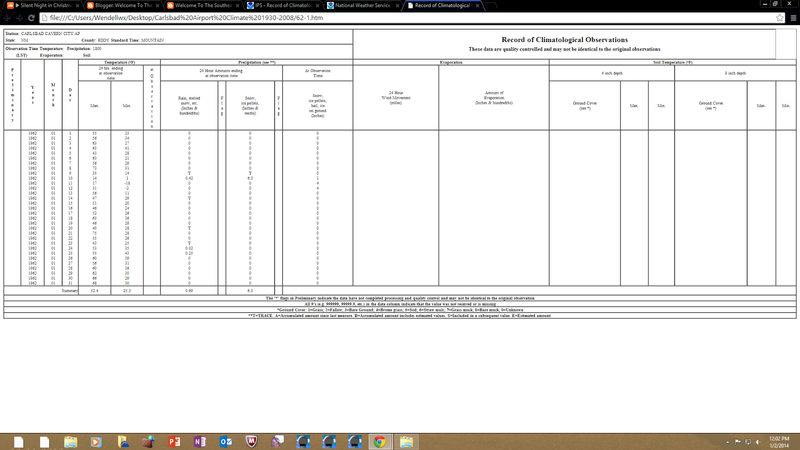 This reading was taken near the present location of NMMI in downtown Roswell. 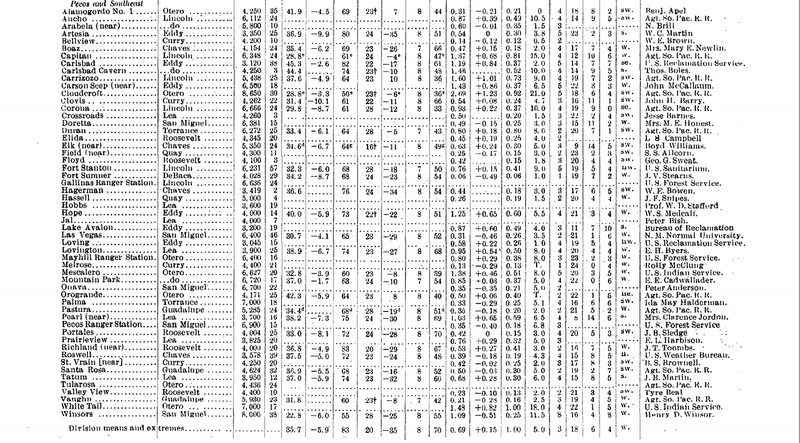 Other Local Low Temps Febuary 8, 1933. 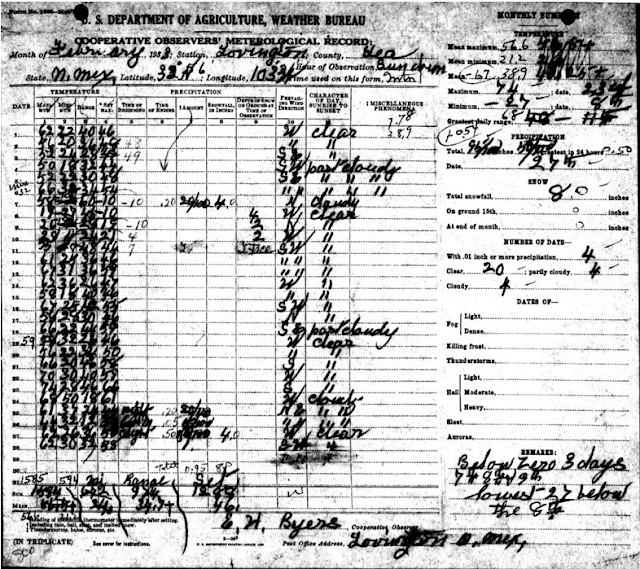 Other extreme local low temperatures recorded on February 8, 1933 include -30F by the National Weather Service Climate Observer at Pearl, which was located west of Hobbs in Lea County. 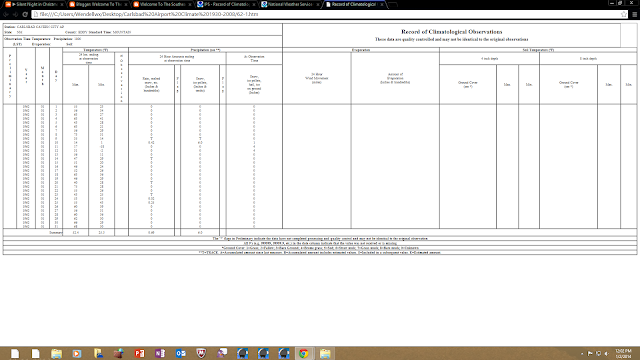 Richland in Roosevelt County fell to -29F. Portales recorded a low of -28F, the Mayhill Ranger Station -27F, and Fort Sumner -23F, Fort Stantion northeast of Ruidoso -18F, Elk which is located east of Mayhill -11F, and Cloudcroft -6F. Dulce located in northern New Mexico recorded the states lowest temperature of -48F, which at the time set a new all-time low for New Mexico. On January 11, 1962 the Carlsbad Airport recorded a high temperature of 17F. This after a morning low temperature of -18F. So this reading exceeds the Carlsbad Climate Co-Op Stations reading of -17F on February 8, 1933, and is the official lowest temperature on record for Carlsbad, New Mexico. New Mexico's Lowest Recorded Temperature. The lowest temperature recorded at regular observing stations in the State was -50° F at Gavilan on February 1, 1951. 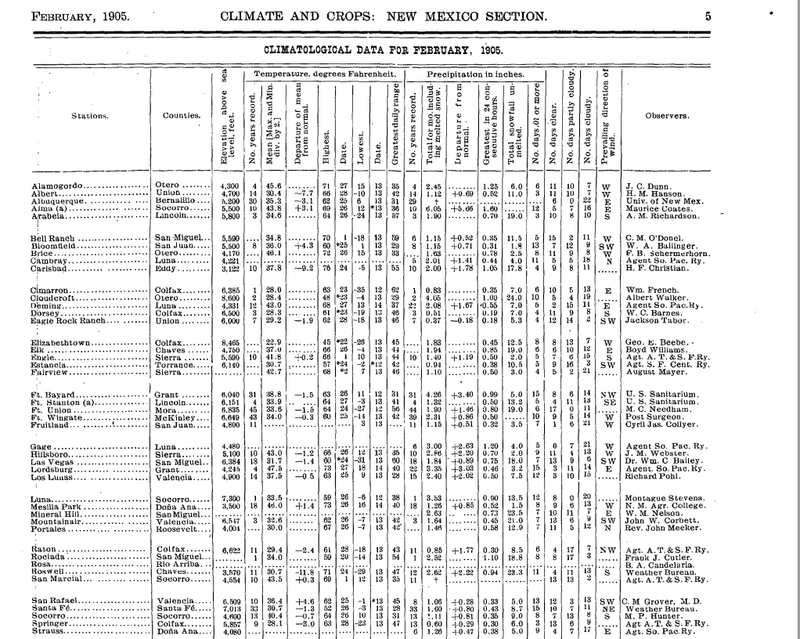 An unofficial low temperature of -57° F at Ciniza on January 13, 1963, was widely reported by the press. 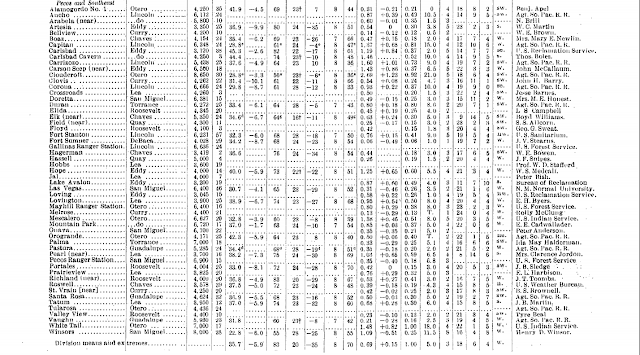 A Historical Listing Our Of Our Temps Below 0F. 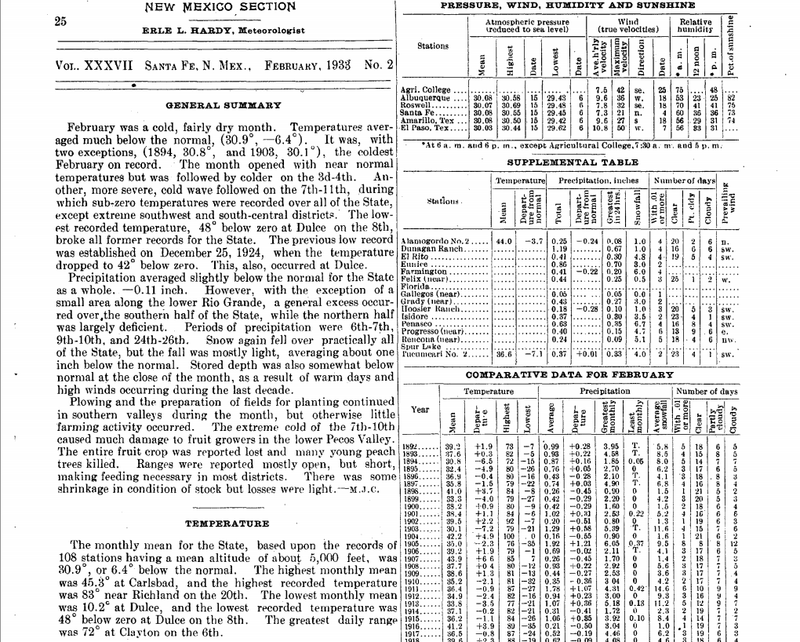 Note- There are many dates in the past where single digit temperatures from 0F to 9F that have been recorded in Roswell, Artesia, and Carlsbad. I get asked a lot if I think that our winters are warmer now than what they were in the past. My answer is yes they are. You can clearly see this by looking at the years in which the thermometer fell below 0F across the area.